There's an old saying that I suppose could be used in many regions but it seems especially pertinent in Western New York, maybe you've heard it before...If you don't like the weather, wait a minute. About 72 hours ago it was in the single digits Fahrenheit, then yesterday it warmed up to spring-like temperatures and poured rain all day, and now as I type these words it's frigid again. This morning when I woke it was sunny, and just before I left for work the clouds seemed to speak to each other and push together just in time to squeeze out a short burst of snow. 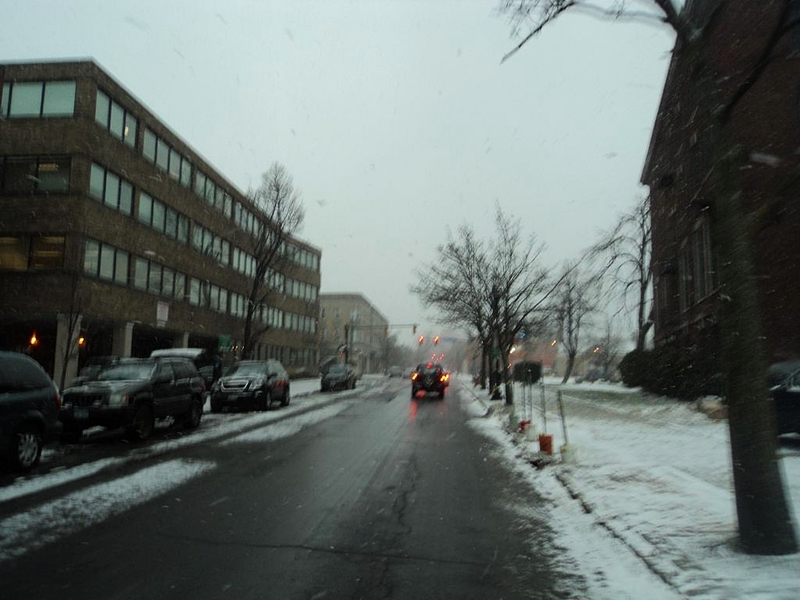 The picture above is a snapshot of my morning commute as I approached Delaware Ave on Allen. The photo is blurry for two reasons. The first is that the camera was shaking...I pulled it out of my pocket as I road and snapped a shot, but the second--and this is something the camera didn't capture that well--was because of the gush of snow. I don't take or show pictures of myself too often on the Internet, but below is a self-portrait of sorts that I took just before I left the house (gotta love the reverse camera feature on the iPhone). Anyhow, one of the many tings I enjoy about riding a bike in all weather is just that...the weather. A biker is not only keenly aware of of nearly every pothole or crevice in the road of his/her regular commute, but also of the weather conditions. And for that I am grateful. Brrr, I am such a wimp. I can barely stand to get from under the covers on these cool mornings (41*F). I will take the bike out when it gets above 50*F, if it's not windy, but when it rains now the great outdoors is safe from me. I just don't seem to be as tough as I used to be. Hawaii looks better all the time. Old Fool...understood. It's getting tougher for me each year, but there's still part of me that really enjoys the cold. I spent some time in Southern Louisiana in the mid-1980's and found the heat and humidity oppressive. "Six of one and a half dozen of the other." Any extreme weather makes things difficult I think...and with global warming I think we're in for a lot of it (extreme weather). Thanks for visiting.